After a morning spent at the flower market picking out blooms for a special project we have coming up on Monday, we were reminded how herbs invigorate the senses and so for today's #fridayflorals installment, we're talking Herbs! Not only will using herbs in lieu (or to complement a minimal selection) of flowers save your budget dramatically, but they'll also provide a fragrant, unique decor addition and have a myriad of uses both during and after the wedding. We've collected a gallery of images to inspire you with some of the many ways herbs can be incorporated into your big day. Bay garlands make stunning additions to tables, your sweetheart chairs or to accent draping. Opt for herb infused ice cubes or water to lend invigorating flavour to simple water. Offer herb infused olive oil bottles as favours. Add a sprig of rosemary or olive leaf to your table settings. Tie bay leaves around candles and fasten with twine or ribbon. Offer rosemary butter biscuits or similar herb-infused treats as favours for your guests. Use herbs to decorate your cake in an inexpensive yet dramatic fashion. Use herbs for your boutonnieres and never worry about blooms bruising in the heat. If you use lavender or jasmine, you'll also calm any wedding day jitters. 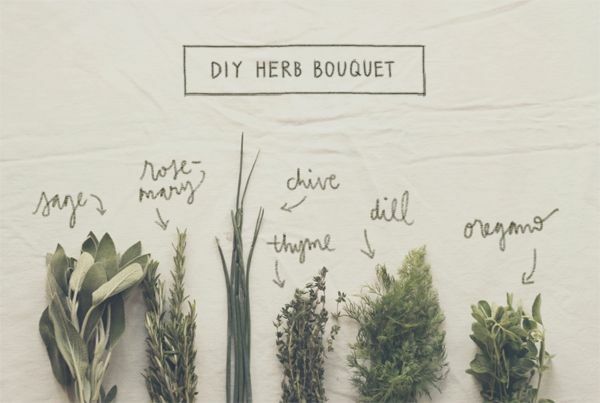 Use herbs in your wedding bouquets, corsages and crowns. Make a bridal crown or Laurenl Wreath from stalks of Rosemary. Use potted herbs in your table decor and offer them as favours for guests to take home or take them home yourselves to create a useful herb garden in your newlywed home. OFfer your guests a stalk of Rosemary with their ceremony programme and have them slide the leaves off in one movement to create biodegradable confetti or leave intact as herbal 'wands' marking your path through the recessional. Another option is to walk down the aisle sans bouquet and have your guests hand these stalks back to you during the recessional to create a bouquet reflecting the love and well-wishes of your guests as your first act as a married couple. Add herbs to placecards for an inexpensive yet effective impact. We hope you'll incorporate herbs into your wedding day, they're such an effective way to cut costs while still providing fragrance, beauty and organic elegance for your big day. Remember too that Harlow Garland's florals department, 'HG Blooms' is is ready and excited to help you achieve your dream wedding bouquet or floral decor with our expert floral styling tailored entirely to you.